New York (June 18, 2013) - Sumthing Else Music Works, the premier label dedicated to licensing and distributing video game soundtracks, today announced the upcoming release of the original music soundtrack from Company of Heroes™ 2, the sequel to the highest rated strategy game of all time*. The Company of Heroes 2 Original Soundtrack is scheduled for a worldwide physical release on June 25, 2013 to retail outlets through Sumthing Else Music Works, and simultaneously for digital download at www.sumthing.com, Amazon MP3, iTunes and other digital music sites. 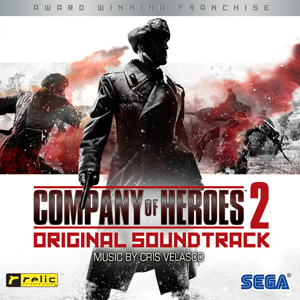 The Company of Heroes 2 Original Soundtrack features the original score composed by Cris Velasco, one of the most prolific composers in the medium, best known for his music featured in the Borderlands, God of War and Mass Effect franchises. Recorded with the Capellen Orchestra and Choir, featuring world-class orchestra musicians and choir from the Czech Republic, Slovakia, Austria and Hungary, the original score for Company of Heroes 2 majestically captures the solemn heroism and human tragedy of the Eastern Front conflict during World War II. Company of Heroes 2 is scheduled to be released for PC on June 25, 2013. For more information visit www.companyofheroes.com.